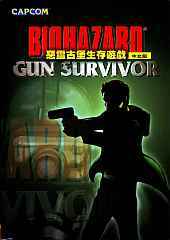 The PC version of this game was only released in the Far East while a console version was released elsewhere name Resident Evil Survivor. This is a totally new evolution of Resident Evil - a first person shoot em' up designed for light guns similar to the popular House Of The Dead game. Similarly, your path through the game is predetermined. You simply have to shoot item objectives as you go through it. You take on the role of a desperate man fighting to free himself from the horror of the T-Virus, armed only with a gun. The victim of a terrible helicopter crash in a zombie infested town, he has lost his memory and now only his instinct can keep him alive. It contains 3D real time backgrounds and fully ambient sound with 3D sound support. You can play the game with a much higher resolution compared to the PSX game. It's compatible with the G-Con 45 gun and Analog Controller (Dual Shock).